The first step in tree removal is to determine whether your tree is a hazard to you or your property. Do you think your tree might be a hazard? Does it have a cavity in the trunk or main stem? Inspect the trunk of the tree. If there are any holes in the trunk, the main stem or at the root flair this could be a concern. Root rot? Your tree will show above ground signs of root rot. Look for branch die-back, white or bleached looking wood, discoloration of needles or leaves, and excess resin in conifers. Fungal growth around the base? Mushroom conks? Check the base of the tree and the trunk for mushroom growth. This may be a sign of fungal growth. This growth only occurs on dead tissue. Multiple stems with weak crotch areas? Does your tree separate into two stems? This is called a co-dominant stem. Are the branch attachments V-Shaped? U-shaped attachments are stronger and less likely to fail in a storm. A tree’s natural form is tall and straight with one stem, trees with multiple stems are more likely to split or fall. Included bark? Are the stems so close together in a v-shape that bark stuck between the attachments? Included bark is a weak attachment for the tree or stem. Root zone impacted by drought or construction? Compacting the soil on top of the root zone can kill the roots of the tree. The roots are the anchor that hold the tree in the ground. The “root zone” is approximately the area directly below the spread of the branches. If your tree shows any of these signs of decline call a Certified Arborist to assist you with your tree care needs. 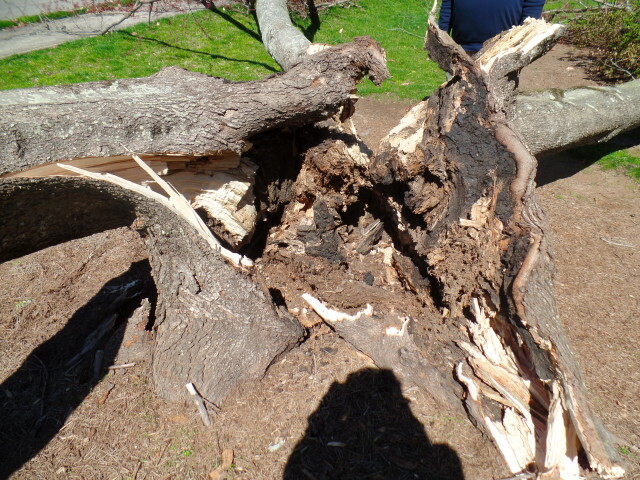 A Certified Arborist is trained in all areas of tree care and can help you save your tree before removal is necessary.